Hemispherical thick-walled bowl decorated with grainy matte glaze of natural/beige ground with two blues and black. Exterior decorated with blue bands and four sets of three dancing bunnies. 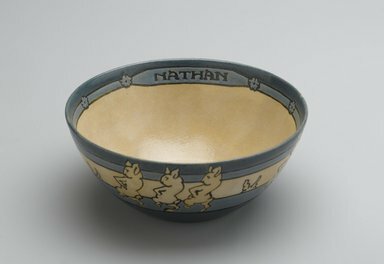 Interior rim decorated with two thin blue bands dotted by small rosettes and labeled in black "NATHAN."